A tropical storm is gripping the East Coast. On television, blocks of red and yellow march across the radar map like an endless, invading army. Sheets of cold rain encourage everyone to stay indoors. But at the Bynum General Store, a music venue about 15 miles south of Chapel Hill, the Holland Brothers are about to go on stage. And the stage is outside. The weather doesn’t faze locals one bit. 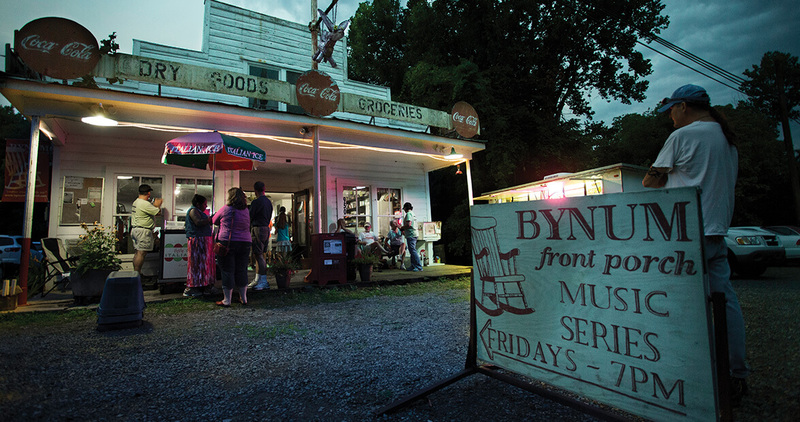 They fill the benches on the general store’s front porch, beneath faded metal Coca-Cola signs and a suspended purple “critter” created by renowned Bynum artist Clyde Jones. They know that, rain or shine, the music still plays. The Bynum General Store once served as the hub of this former cotton-mill town. Under pressure from large grocery chains, the store, which had been in business since 1936, fell on hard times and closed its doors in 2006. A concerned group of Bynum locals gathered in Molly Matlock’s living room to drink some wine and figure out how to keep the store open. They decided to rent it from the owner for a year and reopen the store as a gathering place. And a concert series, which began in 2001, would be the main event. On this night, Bynum’s resourceful folks won’t let a little rain stop them. Inside the store, they’ve built a small stage just for such occasions. Backed up against rows of metal mailboxes filled with Christmas lights — the store also doubled as the town’s post office — the indoor stage comes with a sound system, though you can hear every note without it. The front doors stay propped open and folks on the porch enjoy the Holland Brothers’ plaintive country folk and throaty blues stomps along with those inside. What the indoor show loses in natural setting, it makes up for with its simple, nostalgic atmosphere. The smell of unfinished pine floors, worn from long years of dusty boots, sets the mood. Shelves full of old transistor radios, an open library of paperbacks, and faded gas station signs complete the picture. Folks here nod along to the lyrics of “Collard Greens and Black-Eyed Peas.” They laugh at the stories the two musicians, identical twins Mark and Michael Holland, tell. And they are transported by churning guitar riffs and keening harmonica wails that bounce off the wall of glowing mailboxes and circle around the room. A boy with a bowl cut lies across his mother’s lap in the front row, arms and legs extended as if he were flying through the air. His mother keeps time with her hand, patting the small of his back. To hear Django Haskins’s Friday Night Music playlist of North Carolina musicians, visit ourstate.com/friday-night-playlist. It’s warm and dry in the store. Not just because of the roof, or the change in weather. The community that gathers here provides as much shelter and warmth as the building itself. As the evening darkens, the brothers’ voices take flight and merge with the natural sounds of life: the replies of mockingbirds, the soft tapping of shoes on pine floors, the sound of a little boy dreaming. At the nearby historic Carolina Inn in Chapel Hill, two-story columns watch over a wide front porch like umbrella-carrying butlers. People gather on this porch, and they sprawl out on the lawn in blankets and lawn chairs, and they listen as local band Down River launches into “Bury Me Beneath the Willow.” As the song picks up steam, singer Hope Marasco shapes the notes so effortlessly that it’s easy to imagine her singing it on a similar evening on the front porch of her family’s home. Singing alfresco comes naturally to her. “We didn’t have electricity or running water, and our family’s only form of entertainment was the music we made together,” Marasco says. She and her band seem at ease playing together, as if they, too, were gathered on the porch of someone’s home. The Carolina Inn has sponsored the Fridays on the Front Porch music series since 2002, with free roots music concerts from April to September. Longtime music fans and older alumni rub shoulders with Carolina undergrads. Clusters of parents enjoy some much-needed outdoor time, keeping one eye on their kids and the other on the band. The crowd spans several generations. No wonder: The music is timeless. Half-moons of guitar, banjo, mandolin, upright bass, and fiddle have graced similar patios and lawns for well over a century, ringing out the end of a working week. These sounds are as native to the North Carolina air as train whistles or birdsongs. Marasco slips into clogging shoes and unleashes an expert bit of buck dancing as the band backs her up with “Hello, City Limits.” Barely winded, she grabs the microphone and finishes the song. Two or three little girls, bashful at first, slowly goad each other into a twirling dance on the lawn in front of the stage. Pretty soon, a swirling mass of kids, teenagers, even a few adults join in. The music gathers these folks and provides a soundtrack, but this is no symphony hall. They may not all be listening quietly, but this community builds its bonds around music. And without it, the front porch would be just that: a quiet place to pass a few moments while staying at the hotel. This way is better. 5 p.m.–7 p.m. until September 27. Friday Night Music Across N.C.
September 13. Gates open at 5 p.m. Riverlink Sculpture and Performance Plaza, River Arts District. riverlink.org. Enjoy bluegrass music and cool mountain breezes on the manicured lawn of The Best Cellar, 203 Sunset Drive. 5:30 p.m. Every Friday from May-October. ragged-gardens.com. Open jam sessions every Friday night. 755 St. Stephens Church Road. themontgomerystore.com. Styles range from jazz to rock and bluegrass to pop music from the ’50s and ’60s. Last Friday of the month through September; 6:30 p.m. The Old Courthouse at the corner of Churton and King streets. hillsboroughartscouncil.org. Second and fourth Fridays through September. 7 p.m. King Central Park, 302 Kirby Road. foothillshayride.com. Waterfront businesses host this celebration along Queen Elizabeth Avenue. Includes music ranging from bluegrass to rock ’n’ roll to high school jazz bands. First Friday of the month through December. 6 p.m. darearts.org. Seasonal events featuring music will be held September 20, October 11, and November 29. 5–9 p.m. Downtown. downtownsalisbury.com. Concertgoers are encouraged to bring food donations for the Food Bank of Central & Eastern North Carolina. First Friday of the month through October. 5:30 p.m. Grassy knoll across from Sunrise Theater, 250 Northwest Broad Street. firstfridaysouthernpines.com. Local bluegrass performed every Friday. 7 p.m. 6495 Hudlow Road. unionmillslearningcenter.org. Listen to gospel, country, rock, and beach music by the waterfront. Third Friday of the month through October. 6 p.m. Market and Main streets. mitswashingtonnc.com. Django Haskins is an author and songwriter in Durham.